some of the other presentation pics were taken by me so click on the link below to see them! 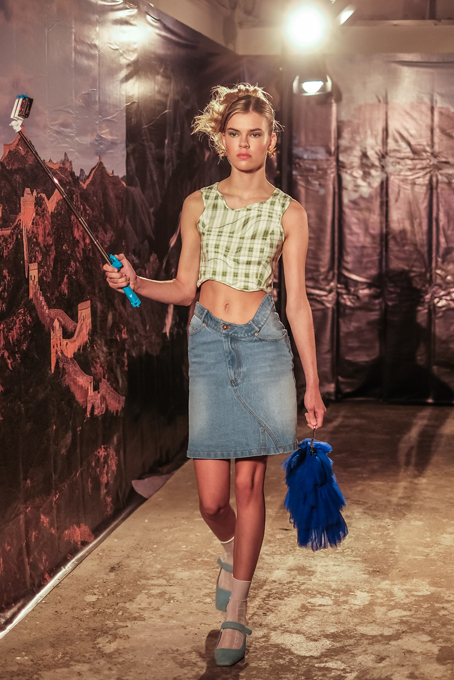 MARRKNULL’s collection initially seems to be a humorous take on the stereotypical “Chinese tourist” as we see models wearing hiking boots and baseball caps carrying bejewelled phones and selfie sticks. With a backdrop of various Chinese landmarks, it’s easy to see where this inspiration could have come from. 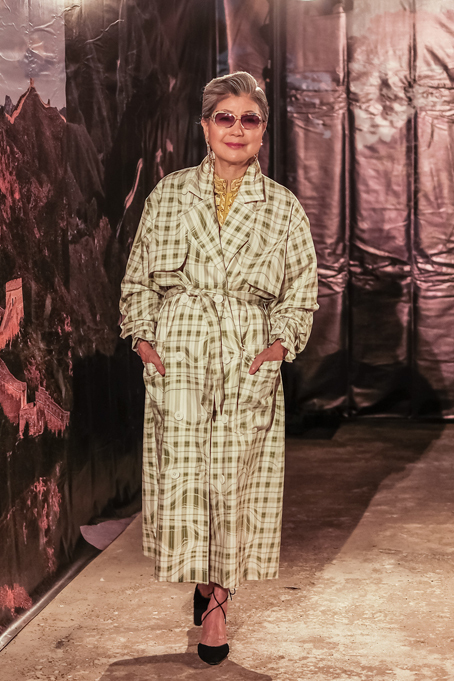 Upon further reflection, however, we realise that this season’s clothing is actually a celebration and exploration of Chinese culture. Both traditional and contemporary aspects of the Chinese social landscape are included- we see gold dragon motifs on a mesh top, lucky red in sports jackets, and my personal favourite, a qipao-inspired black denim dress. The base colours of the collection are muted, perhaps reflecting the geographical landscape of China, and we see greens, greys, and navys forming the majority of the colour palette. Spring/Summer comes through, however, in loose ruffled skirts and a light green check. Most of the looks have a sportswear-meets-tailoring vibe (we see tracksuits and suits equally) as well as a classy-meets-casual vibe (trench coats exist alongside jeans). A fun side note: the presentation ended with a bright pink bridal look, in which the model’s veil was attached to a sun visor! !